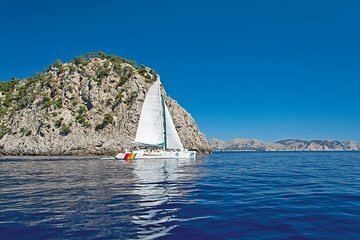 Take a day cruise along Mallorca’s North Coast on a safe, stable, and fully-equipped catamaran sailboat. Glide across the water, taking in the gorgeous views of the Aucanada lighthouse, Es Coll Baix Beach, Bay of Pollensa, and Formentor Peninsula. Swim in crystalline Mediterranean water, sunbathe on the boat deck, and snorkel, kayak or paddleboard with equipment provided. Enjoy a delicious barbecue lunch and drinks included in your outing.